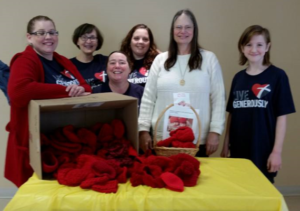 Faith Lutheran Church in Madison, Alabama, participated in the Little Hat, Big Hearts project for the American Heart Association. We shipped 98 tiny red crocheted hats, which were distributed to newborns. We are also continuing our Hats for the Homeless crocheting project for the Downtown Rescue Mission. In addition, the youth group collected travel size toiletry items to give to foster teens. Faith Lutheran has started a new outreach project – collecting items for the homeless in tent cities. We are collecting propane, propane heaters, regular and emergency blankets, tarps, and coats. Faith Lutheran looks forward to fellowship and participation in other mission projects in Madison and Huntsville.